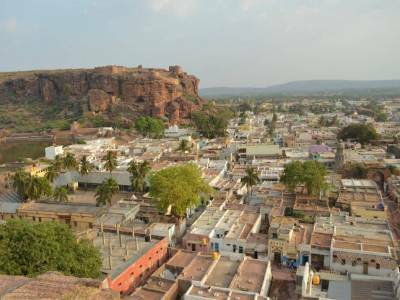 Badami is a town of Bagalkot district in the southern coastal state of Karnataka in India dating back to long way back in historical timelines. 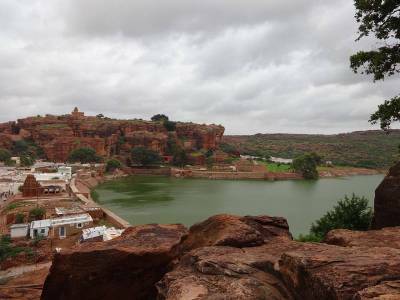 Badami is also popularly referred to in historical or literary mentions as Vatapi which was its former name when it served as the capital city for empire of the Badami Chalukyas from 540 to 747 AD. 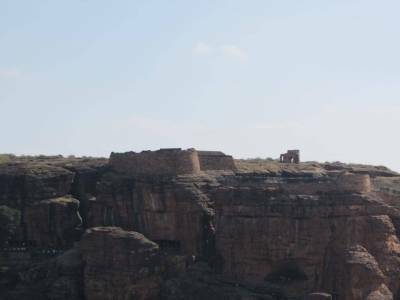 and reached great heights of achievement during this period for its rock cut monolith temples with iconic and landmark relief works and motif carved out of and onto stone edifices. Badami is famous for its historical ruins, rock cut temples and cave temples. Badami was earlier named as Vatapi. The name Vatapi is a legendary name relating to Sage Agasthya. Two demon brothers Vatapi and Ilvala alias Badami used to kill innocent visitors for their food by tricks. The elder Ilvala would turn Vatapi into a goat and offer its meat to their guests. After the guests consuming the meat Ilvala would call out the name of Vatapi. Due to certain magical power Vatapi was emerging from abdomen of the consumer resulting in his death. Then both brothers fed themselves with the flesh of dead guests. But their trick did not work against Sage Agasthya who digested Vatapi before Ilvala could call him saying “Vatapi jeernobhava” [let Vatapi be digested]. Then Agasthya killed Badami. Thus symbolizing those two demons two tall rocks in Badami represent the demons Vatapi and Ilvala. 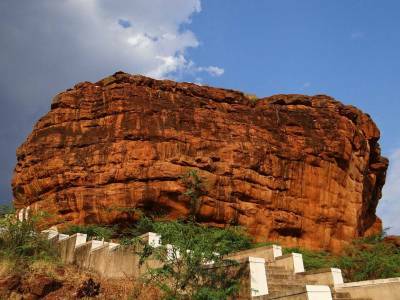 Tourist attractions of Badami is "Badami cave temple", "Badami Fort", "Agastya Lake","Bhuthanatha Temples" and "Badami Museum"
Accommodation : There are several options available for accommodation i.e. budget, mid-range and luxury hotels with good facilities. Accessibility : Belgaum Airport is nearest at 150 KM. But it is better to travel across Bangalore. Badami is situated on Hubli-Sholapur rail route at 163 KM from Bijapur and 128 KM from Hubli. 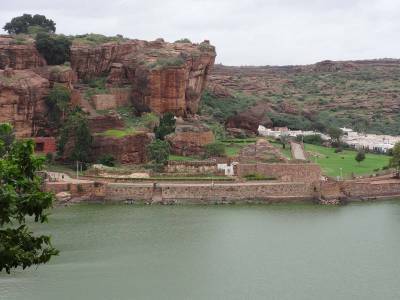 Get quick answers from travelers who visit to Badami.